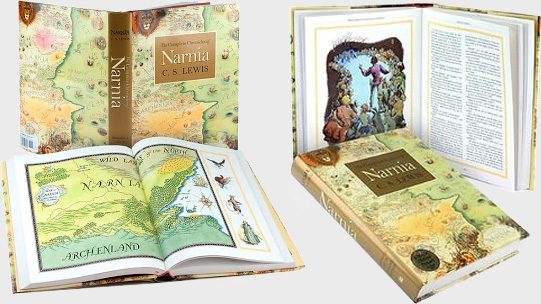 All seven tales in The Chronicles of Narnia are bound together, with full-colour illustrations, in one magnificent oversize hardcover volume with a personal introduction by Douglas Gresham, stepson of C. S. Lewis. This edition presents the seven books - The Magician’s Nephew, The Lion, the Witch and the Wardrobe, The Horse and His Boy, Prince Caspian, The Voyage of the Dawn Treader, The Silver Chair, and The Last Battle - unabridged and arranged in C.S. Lewis’s preferred order, featuring full-color artwork by the original illustrator, Pauline Baynes. This series of seven books by British author, C.S. Lewis, is one of the best-known children's book series of all-time. Now translated into more than 40 languages, the books were originally published in the 1950s and have sold over 100 million copies. The books' central focus is on various children from the real world who are transported to a fantasy land called Narnia. Narnia is inhabited by mythical creatures, including a talking lion called Aslan. The author was an avid reader of Greek and Roman mythology and was also heavily influenced by Celtic fairy tales. The books have, of course, inspired numerous stage adaptations and several features films, most notably a 2005 film that grossed over 400 million dollars.